The top teams from the recently concluded Turbo Knockout football competition collected their cash incentives for their outstanding performances in the 16-team tournament which saw the Georgetown Football Association (GFA), East Bank Football Association (EBFA), East Demerara Football Association (EDFA) Football and the West Demerara Football Association (WDFA) being represented. 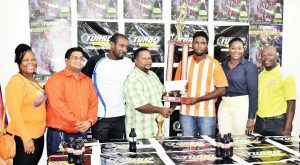 Turbo Manager Samuel Arjune (centre) hands over the C/ship trophy and $500,000 cheque to Camptown FC captain Lezhan Lord with MVP Richie Richardson (3rd from left) flanking him. The surprising winners of the tournament that was organized by the Petra Sports Coordinating Company, Camptown FC, received their $500,000 first place cash prize and their Turbo championship trophy. Perennial tournament favourites, Police FC, who couldn’t get past the defensively sound Camptown in the final, received $250,000 for their second place finish and the corresponding accolade. Pouderoyen FC received $125,000 for third, while Grove Hi-Tech that finished fourth pocketed $75,000. Camptown FC goalkeeper, Richie Richardson, was awarded the most valuable player of the tournament for his three clean sheets in the tournament that witnessed him conceding a solitary goal. Co-director of Petra, Troy Mendonca, during the simple presentation at Diamond, East Bank Demerara, in the boardroom of the sponsors Guyana Beverage Company (GBC) Inc. (the distributors of the Turbo Energy Drink), explained that, “When this tournament was conceptualized it was just a means of keeping the momentum of football in the Georgetown area going, after the recently concluded Corona tournament.” Mendonca further stated that he believes at the end of the tournament, although Camptown lifted the Championship trophy, he believes that, “That the sport of football is the overall winners”, because of the smooth running of the event and the relations developed with the various football associations, “And I would like to thank all the clubs and players that participated”, Mendonca concluded.